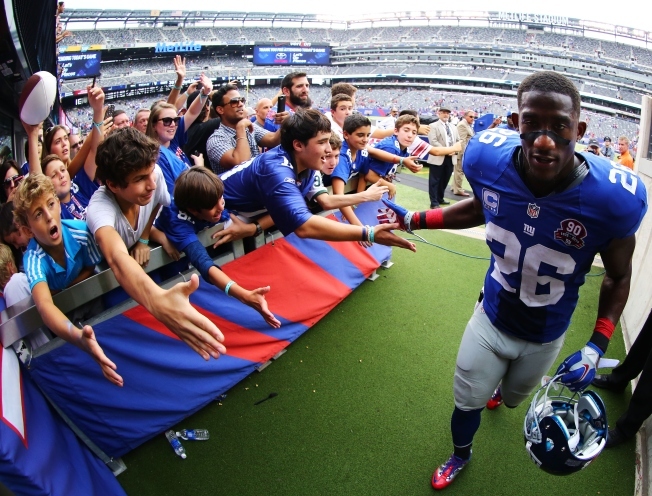 Antrel Rolle #26 of the New York Giants greets the fans after their 30-17 win against the Houston Texans at MetLife Stadium on September 21, 2014 in East Rutherford, New Jersey. If there's any word to describe what's guiding the efforts of new Chicago Bears General Manager Ryan Pace as he tries to improve the team's roster, it's versatility. Pernell McPhee was a tremendous example of that, as the defensive end/linebacker told the media on Wednesday at Halas Hall that he is willing to play anywhere that he is needed. According to the team, his first assignment will come at outside linebacker in Vic Fangio’s 3-4 defense, but he can also play defensive end in both a 3-4 and a 4-3 setting, he can play nose tackle in a pinch, and he’ll be able to line up at a number of different positions overall, meaning that teams will have a very difficult time defending against him. That’s going to be a critical thing for the Bears this season as they try to improve their anemic pass rush from a season ago. If you have a guy that forces mismatches all over the field, it will open up opportunities for other players to get free shots at the quarterback and get easy penetration into the backfield, and Pace securing a talent like that will give the defense a real shot in the arm. That theme of versatility continued with the signing of safety Antrel Rolle on Wednesday night. Rolle is a player who covers a lot of ground as a safety and has a very good feel for the game, and those are both qualities that the team lacked with their large group of safeties last season. His presence will allow the Bears to shift some other pieces around, allowing Ryan Mundy to focus more on special teams (something he’s actually really good at) and giving Brock Vereen a chance to sit back and learn more at the safety position instead of being forced to play a ton of snaps because of injury and ineptitude. Having pieces that can fit in a variety of spots is an important asset for a Bears defense that is trying to fill numerous holes with a limited amount of salary cap space. With big deals for Jay Cutler and Jared Allen still clogging up the works, the Bears had to target players who could play in multiple spots and could allow their current players to slide into more effective roles, and that’s exactly what the Rolle and McPhee signings have done.